Jesus had promised Peter that he would receive the keys of the kingdom and on Pentecost that promise was kept. Peter extolled the crowd to know the Jesus whom they crucified was the Christ. Three-thousand devout Jews obeyed the gospel as the church began to grow in spirit and number. In the beginning, the focus of the gospel was upon the Jews. Then came the day the door was open for the Gentiles and Peter was at center-stage once again. Cornelius, a centurion in the Roman army, was a devout man who feared God with all his household, gave alms generously to the people and was a man of deep prayer. 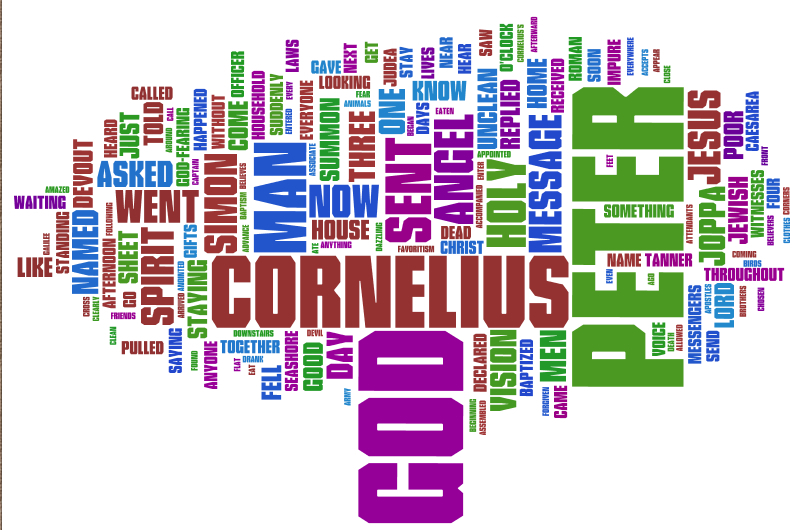 Through the direction of God, Peter was brought to Cornelius to preach the good news of Jesus Christ. His sermon to the household of Cornelius is a powerful testimony to the simple message of redemption found only in Jesus Christ. Point One – The gospel is for all men, regardless of nationality, gender, age, race or economic status. God has no partiality because He created all men. All the unique qualities of man are there because the Creator God made all men in such a manner. Sending His Son to earth was not to die for a select few but for all men. Point Two – The Lord will bless any man or woman who fears Him and works righteousness. Faith is the beginning of the journey to salvation and that faith must rest upon the knowledge of the Almighty God. Peter was preaching what James would later describe as faith and works. Without faith and works, there is no salvation. Point Three – Everyone who comes to God must believe that Jesus is the Christ, the Son of the Living God. Taking up the cross and following Jesus demands first place in every part of life. Jesus will be Lord of all and nothing will be accepted except total devotion to the will of the Father. Obedience demands the sacrifice of self. Point Four – Knowing the story of Jesus is what convicts the heart. Too often people become Christians without knowing the true nature of Jesus. Believing Jesus is the Christ demands the knowledge of His power, His works, His teaching and His example. Jesus is the only way to the Father and His story is the only story that can save. Point Five – The story of Jesus is true because Peter and many others testified as witnesses of the life, death and resurrection of the man from Nazareth. The Bible is not a book of fairy tales created by man. God’s word is true because it comes from His mouth and the reliable evidence of eyewitness accounts confirms it. Point Six – The resurrection. Nothing is more critical than believing in the resurrection. This did not happen in a corner and many in the day of Cornelius could go to the tomb of Jesus and see He was not there. Without the resurrection, there was no gospel. Everything hinged upon the evidence of the risen Savior. He arose and He lives. Point Seven – The early disciples were charged with going into the whole world preaching the story of Jesus as the Son of God who dwelt among men, was killed and raised the third day to glory. There is no greater story than the story of Jesus Christ. All those who believe in the risen Savior must tell the greatest story ever told. Point Eight – The Old Testament proclaims the truth of Jesus Christ and now all men are given the fully revealed word of God. Salvation comes in the obedience of the gospel of Christ in hearing the word and obeying every command instructed by the Lord. The power of the gospel is for all men and it will save all men. When Peter finished his sermon, Cornelius and all his household were baptized. A great sermon with a wonderful response. Praise God.